In their waterproof orange overalls, Hannah Perlkin and Emily Tucker look like commercial fishermen or storm-ready sailors. But they are biologists on their way to tide pools along a remote stretch of northern California coast. There they are searching for the cause of a mysterious and unprecedented die-off of sea stars along North America’s Pacific shores. The syndrome took marine scientists by surprise this summer, when sick and dying sea stars — also known as starfish — appeared in a host of locations between Alaska and southern California. Predatory species were the first to succumb, but now the mysterious ailment is appearing in species once thought to be resistant to its effects. The progression is predictable: white lesions appear on an animal and become infected. 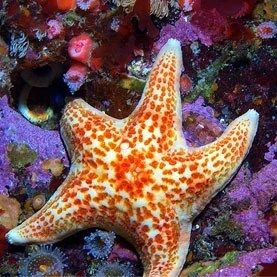 Within hours or days the sea star becomes limp, and its arms may fall off. Necrosis eventually takes over and the animal dies. Among the animals now affected are the scavenger bat star, Asterina miniata; some species of sea urchin, an important source of food for threatened sea otters; and recreational and commercially fished species such as the California spiny lobster (Panulirus interruptus) and sheephead fish (Semicossyphus pulcher). Scientists worry about the long-term ecological consequences of the outbreak, which has affected a larger area and more species than episodes that occurred in 1983 and 1997. Sea-star populations took decades to return to their former numbers after those episodes, which were associated with warmer waters caused by El Niño. The latest outbreak began despite relatively cold surface waters along the Pacific coast for the past 15 years. Sea-star wasting disease has also been reported at sites along the US eastern coast this year, but researchers say that it is too early to link the outbreaks. Pinning down the cause of the outbreak is a high-stakes detective game for researchers such as Pete Raimondi, an ecologist at UCSC. He leads a marine-monitoring programme that has received special funding from the nonprofit organization Ocean Science Trust, based in Oakland, California, to search for the source of the outbreak. Other researchers are working with sea stars to determine whether wasting is an autoimmune condition or caused by an infectious agent. At UCSC, disease ecologist Marm Kilpatrick is beginning a series of experiments in which sick stars are separated from apparently healthy ones by various types of barrier, in hopes of characterizing the disease culprit and how it spreads. Among the possible causes scientists have suggested for the wasting syndrome are low oxygen levels in coastal waters, localized areas of warm water and environmental toxins. Some researchers have suggested that ocean acidification is a possible factor, but Raimondi says that is unlikely, given that acidification is pervasive but the disease outbreak is occurring in patches. Farther north, at Western Washington University in Bellingham, biologist Benjamin Miner is collecting sick and healthy sea stars from sites along the coast to be analysed by Ian Hewson, a microbial oceanographer at Cornell University in Ithaca, New York. Hewson is comparing the colonies of viruses, bacteria and protozoa that live in and on diseased and normal sea stars, looking for a common ‘fingerprint’ that identifies the disease.